Enjoy the spacious 42" tabletop on the ABH-42 Acrylic Bar-Height Table. This bar-height patio table seats up to 4 people comfortably and pairs well with the C-75 Strap Bar Stool or the R-75 Strap Bar Chair. 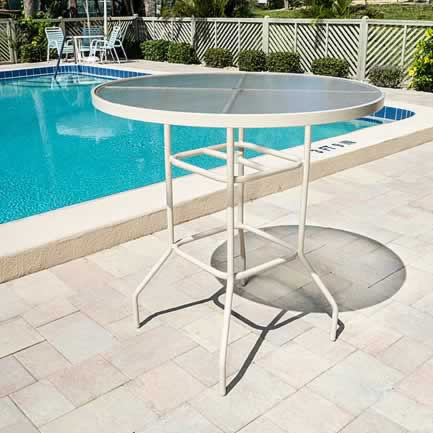 The extruded aluminum base may be powder-coated in any of the available frame finishes and the hammered finish of the acrylic tabletop may be ordered with or without an umbrella hole. Outdoor bar furniture is always a guest favorite. Design yours today!